The JC Modern Marines Special ended on Aug 14th 2011. 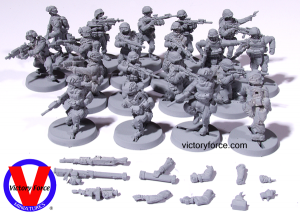 These are figures from the JC Figures Line purchased by Victory Force. They include a leader, medic, and riflemen with the ability to equip some of the figures with either a SMAW, M240 or M249 SAW. Find them in the Specials section of the Victory Store. This is your last chance to purchase these figures as they were originally sculpted. When the line is rereleased, the odds are very good, most will be modified from the originals. Some may even be retired. New workbench story on Sunday. .